A Metro Blue Line train inexplicably ran a stop signal on Wednesday before it struck a Long Beach police car and injured an officer and 10 passengers, according to onboard videotapes reviewed by accident investigators. 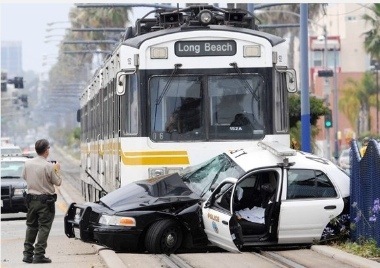 Two tapes indicate that the southbound train rolled through the red signal about 1 p.m. and collided with the patrol car in the intersection of Long Beach Boulevard and 16th Street, Long Beach police said Friday. Ok, so whenever I bring up how dangerous the Blue LIne is, people say to me “Oh, it’s just because drunks and suicides walk in front of it.” All trains have those problems; why does the Blue Line have so much more mortality? I think it’s because the Blue Line is a very long route with quite a bit of potential for conflicts with vehicles and pedestrians–lots of intersections, etc. It will be interesting to see how people will try to spin this deal to blame people in south-central for it–instead of coming up with proposals to fix the problems.